e.s.t., I use a full-immersion strategy: Ubuntu and all applications or web applications in their English versions, plus English university textbooks. It was a radical choice but it helped me a lot. Congratulations, Girgio - it's well-deserved! Congratulations Giorgio! I've been following your posts for a while now and I must say that I find them absolutely outstanding. Thanks for sharing your knowledge, I wish you the best of luck in your coming projects. Good job though, that is pretty awesome. "I'm impressed by the impact that a personal blog like this has been on my opportunities, as a mean to demonstrate my expertise"
"I'm impressed by the impact that a personal blog like this has HAD on my opportunities, as a meanS to demonstrate my expertise." Things have impacts on things, not are impacts on things. 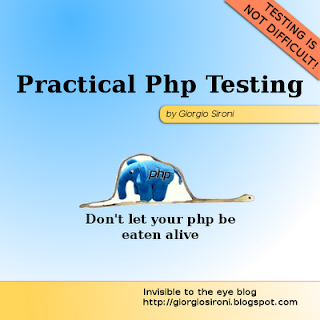 "I had also been invited to propose a talk for the Italian PHP conference, phpDay, which had been subsequently accepted." "I HAVE also been invited to propose a talk for the Italian PHP conference, phpDay, which HAS been subsequently accepted." Given that the previous sentence was in the present tense. "I have no fear about the upcoming Toefl exam"
"I have no fear OF the upcoming Toefl exam"
"I started an open source project, NakedPhp, which has seen some good recognition"
"I started an open source project, NakedPhp, which has RECEIVED some good recognition"
Still, a most impressive command of English in so short a time. I salute you, sir! happy for your achievements.. :) congratulations..
Hey Giorgio, I follow your blog for quite a while and since the start it has been a pleasure to read your posts. Very concise and useful information!. Congratulations! Though I have a question, why don't you chose for your thesis the NakedPhp project you already started? it's not so simple. The teachers make up a list of thesis proposals, and also PHP is not the preferred language in academia.